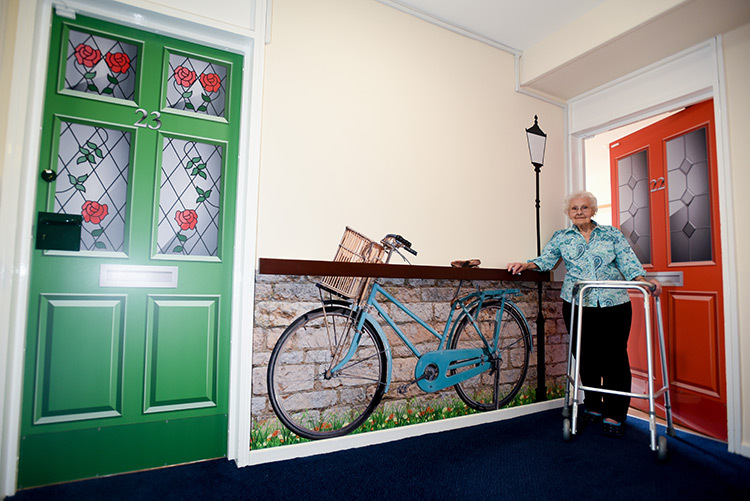 Specially designed wall features and doors have been introduced at the 15-bed unit at Stone House in Bishops Castle to improve the quality of life for people living there. The dedicated 15-bed unit now has artwork including meadow scenes on windows and walls, an LCD fish tank on the wall, bedroom doors that have been revamped to look like individual front doors and corridor walls have been given stone wall effect. 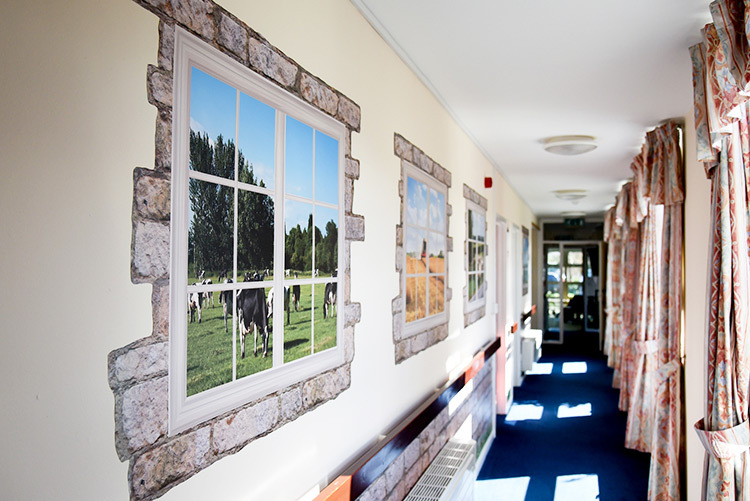 Stone House is run by Coverage Care, Shropshire’s leading independent care home provider, and is home to up to 40 people at any one time, including in the dementia unit. The £8,500 scheme, which has been carried out by reminiscence care specialists Rempods, was partly funded by staff who collected more than £5,500 at a series of events including a sponsored walk, garden fete, promise auction and a bingo session. The Friends of Stone House made a £2,000 donation, Clun Young Farmers Club donated £585 towards the project and Coverage Care met the remainder of the cost. Home manager Keturah Bloor said the residents and staff were delighted with the finished transformation. 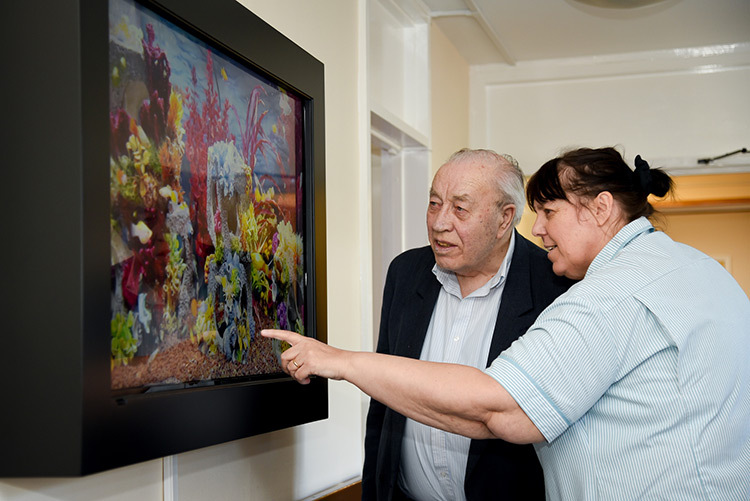 ““The aim was to provide a more therapeutic and individual environment for residents and help them feel better orientated in their environment. 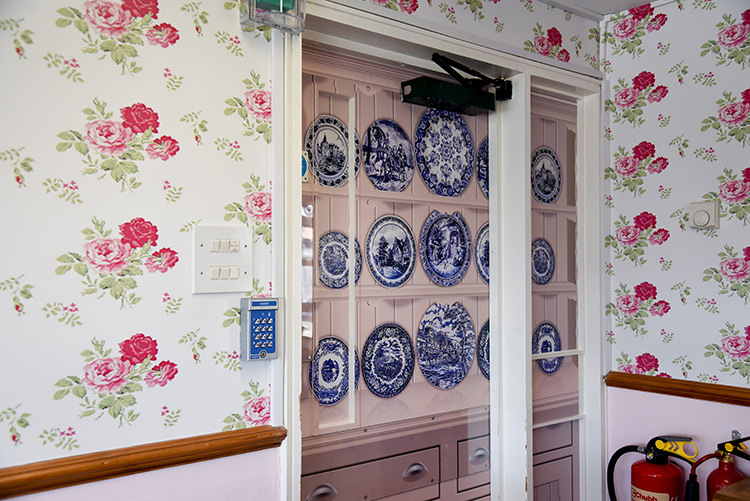 We know people with dementia can get confused and struggle to differentiate between similar doors within a corridor for example so having ones that look different will help them identify better with their surroundings. It also gives them a feeling of ownership of their individual rooms. This entry was posted in Company News and tagged best shropshire care homes, coverage care care homes. Bookmark the permalink.